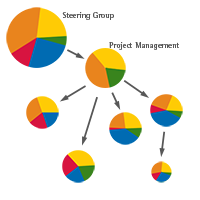 All organizations have to have a certain balance between their drives, fitting to the nature of the organisation. When this balance is disturbed, problems occur. A healthy organisation has congruent parts , encouraging positive behaviours. ICM focuses on the "soft factors" culture and drives. Managers often struggle with these factors, because they seem to lead a life of their own. ICM allows you to measure drives quickly and make culture measurable and manageable. In order to help organisations achieve congruence, Management Drives focuses on the “soft” factors – culture and Drives. Managers often struggle with these factors, because they seem difficult to define and pin down, or seem to have developed organically by themselves. ICM can measure these softer factors quickly and reliably, making the organisational culture quantifiable and therefore open to change.